Discover a whole host of fancy and fabulous party tips and recipes, seasonal craft and activity ideas, and reading-readiness suggestions from the folks who bring you Fancy Nancy! We’ve got you covered! You can click here to print out your very own Fancy Nancy invitations. Encourage your guests to wear their fanciest attire. Crowns, tiaras, boas … and don’t forget the boys! Our motto is: the more bowties, the better! Remember though, gentlemen take their hats off indoors. You might want to consider having a few extra accessories on hand, just in case someone forgets to dress up. You wouldn’t want anyone feeling as though they’d made a faux pas. Drape some glittery garland around your light fixtures or down a banister. Tie a helium balloon to each chair, and you can use crepe paper as a tablecloth or runner. Decorate your birthday space with charming paper lanterns and butterflies of different sizes cut from colorful paper. Enlist an artistic friend to paint pretty butterflies on guests’ faces. Create tees with butterfly outlines, and have guests color them in with fabric markers. Oh my goodness! There are so many creative fans of the books out there, and they have whipped up some amazing-looking food. One of our favorite ideas? Make sandwiches as you usually would. Then use a cookie cutter like this or this to cut out fun shapes. Voila! Fancy finger sandwiches. For dessert, you could try this recipe for Fancy Nancy Birthday Cake or try out our recipe for Fancy Nancy’s Nebulaic éclairs. make fancy feather pens for your guests. 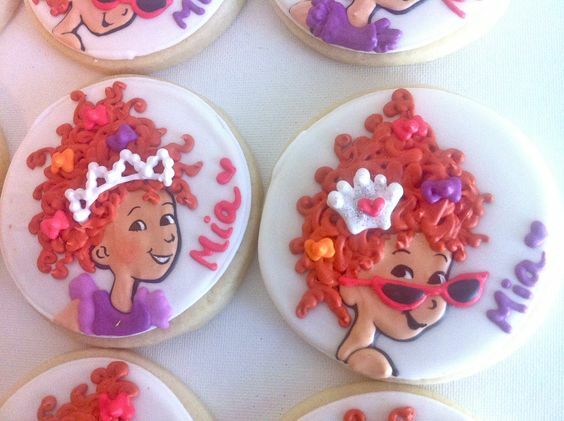 bake (or go to your local bakery and buy) some Fancy Nancy cookies. books always make great goodies, so you could hand out this Reusable Sticker book. Voila! Fancy Nancy Birthday party solved. Do you have any favorite Fancy Nancy party ideas? Don’t forget to check out the Fancy Nancy show on Disney Junior! This entry was posted in Birthday Party Ideas and tagged birthday, Birthday party, party. Bookmark the permalink.